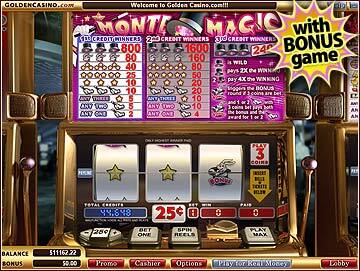 Special: The pot of gold is wild and when one pot of gold appears in a winning combination pays 2x the winnings. When 2 pots of gold appear in a winning combination 4x the winnings are paid. 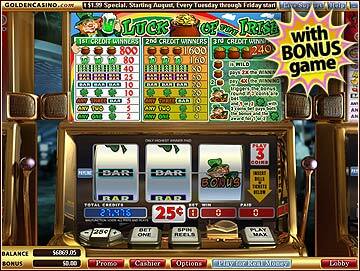 Bonus: The Luck of the Irish bonus round begins when the Bonus symbol appears on the payline. If the 3 leaf clover symbol appeas on the payline at the same time you get the bonus game and the applicable payout for the clover(s). Special: The Top hat is the wild symbol in this game. One hat pays 2x the winnings in a winning combination. 2 hats pay 4x the winnings. Bonus: The bonus round starts when the Bonus Symbol lands on the payline. If one or two magicians wands also appear on the payline then you receive the magicians wand payout and the bonus round. Special: The Sombraro is the wild symbol in Pinata Fiesta. If one Sombraro make up part of a winning combination you get 2x the winnings. If 2 Sombraros make up part of the winning combination you get 4x the winnings. Bonus: The bonus round starts when the bonus symbol lands on the payline. If 1 or 2 Tiquila Bottles land on the payline with the Bonus symbol you get the Tiquila Bottle payout and the bonus round. 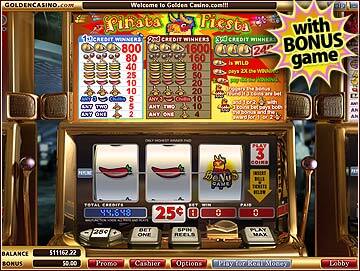 Want to find a good slot machine offer a bribe to the slot attendant. To find a good slot machine ask the slot attendant which machine they think is loose and when they answer give them a tip or offer a cut of the jackpot. A cash incentive is sure to help them steer you in the right direction.